We could just download the source code and use it in our Rails application but this is a little difficult to add to the asset pipeline as the code includes references to images with relative paths that we’d have to fix. Fortunately there’s a jquery-datatables-rails gem available that makes this much easier. We’ll add this to the assets group in our gemfile. As this gem is updated fairly frequently and we want to use the latest version we’ll use the github option and pass in the project’s path. The github option is new in Bundler 1.1. If you don’t have this you’ll need to pass in the full git path instead. As always when adding a gem we’ll need to run bundle to install it. We can now set DataTables up with the asset pipeline. First we’ll go to the application.js file and add a call to dataTables/jquery.dataTables in the manifest. There’s also come CSS we need to include so we’ll need to do add something in application.css, too. 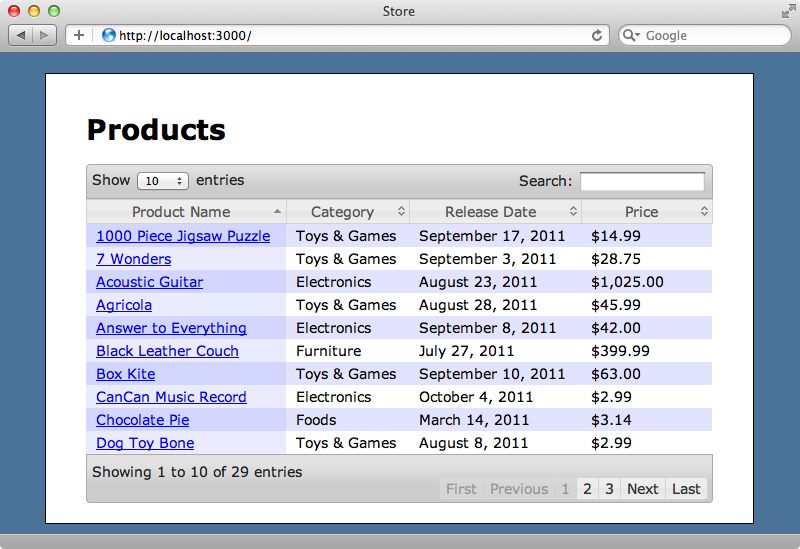 Now that we have DataTables installed in our application we can use it to improve our table of products. The view code for that table is shown below and it’s fairly straightforward; all we do is loop through each product and render it in the table. We can add DataTables to this table now with some CoffeeScript code. We’ll do this in the products.js file. All we need to do is ensure that the DOM has loaded then call dataTable on our table. When we reload the page now our table looks quite different. 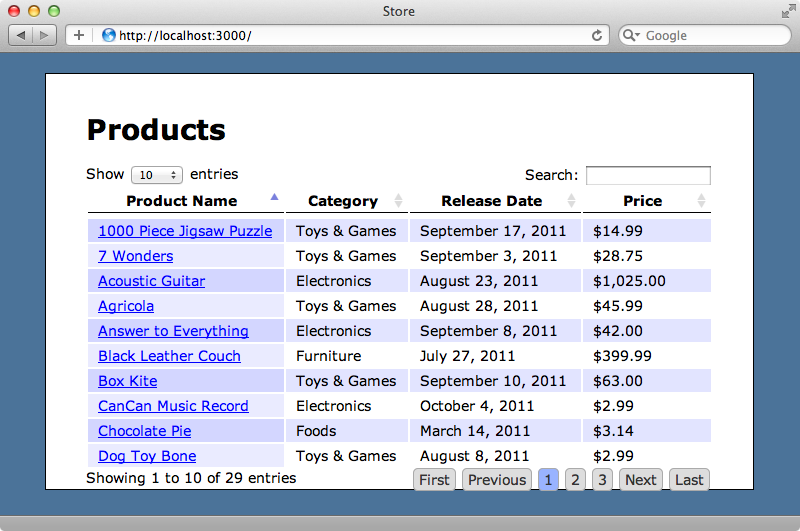 We now have a DataTable with pagination, sorting and searching. There are many different options that we can pass to dataTable to change our table’s appearance and behaviour. For example setting sPaginationType will change the pagination; if we set this to full_numbers this will show a link for each page. The usage section of the DataTables site has a full list of the options we can use to customize our DataTable. Reloading the page now will show the new pagination style. The styling for our table isn’t perfect but we can change this. 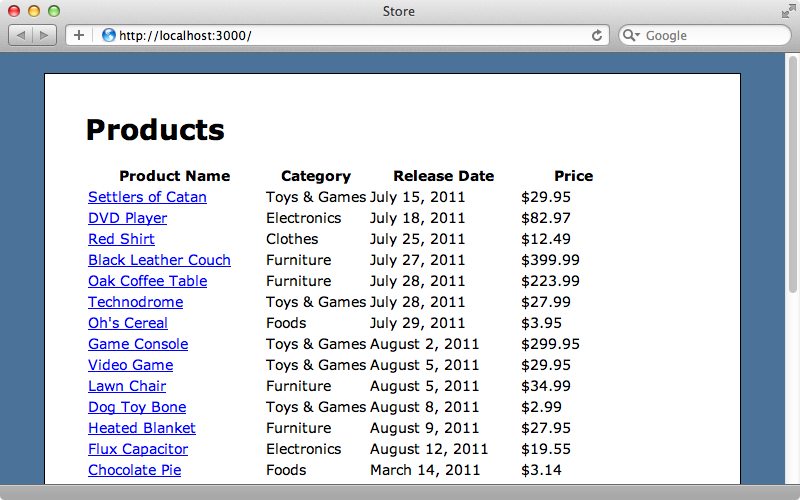 The DataTables homepage has an example table that’s nicely styled and we can use this with our table. The example table uses jQuery UI and this is included in the jquery-rails gem that’s in our gemfile. The CSS styling that we need for our table isn’t included, however, but there’s another gem, called jquery-ui-rails, that does. To add this we just include it in the gemfile and then run bundle again. To add the CSS to our application we need to add jquery.ui.core and jquery.ui.theme our application.css file. This will include the Smoothness theme. We also need to replace the DataTables CSS file with one that is designed for jQuery UI and one called demo_table_jui is provided under the src directory. We’ll replace the jQuery.dataTables CSS with this. We now need to add a bJQueryUI option to our call to dataTable. Finally we’ll need to give our table a class of display. 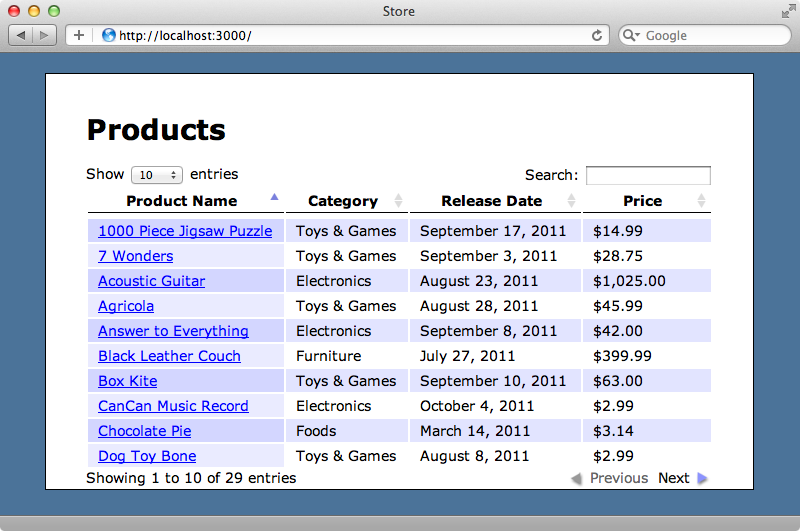 Reloading the page now shows a much better looking table. Our table has pagination, sorting and searching but this currently all happens on the client. Our HTML page includes all the products from the database and DataTable handles choosing the ones to be displayed based on the page, sort order or search term chosen. This works well for small numbers of records, say up to 200, but if we have thousands or even millions of records we don’t want to send all this data to the client to be handled there. In these cases its better to send only the necessary records to the client and have DataTable communicate with the server when the selected page, sort field or search term changes. The Server-side processing page of the documentation tells us the parameters that are sent to the server and what to expect in response through JSON. We need to set up our Rails application to be able to deal with this and we’ll need a way to do pagination on the server so we’ll add will_paginate to our gemfile and run bundle again to install it. We no longer want to display all the products in our template as these will now be fetched from the server. We’ll need to define the URL that the relevant set of products can be fetched from and we’ll put this in a data attribute on the opening table tag. We’ll use the products_url and tell it to use the JSON format. In our Coffeescript file we’ll need to add some more options to the call to dataTable to tell it to fetch data from the server. The bProcessing option shows a “Processing” message while fetching data from the server. Setting bServerSide to true means that the data will be fetched from the server. Finally sAjaxSource sets the URL that the data will be fetched from and we set this to the value in the data-source attribute that we defined in our table. DataTable will now trigger the ProductsController’s index action and it will expect a JSON response. We’ll use a respond_to block to do this. The tricky part will be responding with the proper JSON. One option would be to use something like JBuilder or RABL, but these solutions can get messy very quickly as there’s quite a lot of logic required to generate the correct response. If the MVC structure of Rails ever feels limiting and doesn’t fit with what we’re trying to do there’s nothing wrong with creating a new class if it leads to cleaner code. This is the approach we’ll take here. We’ll create a new ProductsDatatable class to generate the JSON and we’ll have it take a view context in its constructor so that it has access to helper methods. This makes it like a mini-presenter for a JSON response. We’ll create this class in a new datatables directory under the app directory. There’s too much code in this class to show here, but you can find the whole thing on Github. We’ll run through it quickly and show the most interesting parts. The initializer takes a view context and assigns it to an instance variable. We delegate a few helper methods to this view so that we can conveniently call them from here. The as_json method is triggered behind the scenes by the render_json call in the controller. This will return all the data that DataTables expects including all the relevant rows from the database. This data comes from a data method and this method loops through each of the products and returns a two-dimensional array containing the information for each cell in the table. The products are fetched in a fetch_products method. This fetches the correct page of data in the correct order filtered by a search term if one is present. The search query itself is simple but we could expand on it, maybe by using a full-text search engine such as Sphinx or Solr. The rest of the class is made up of methods to help with sorting and pagination. Now that we have this class we can use it in our controller action. When we reload the page now (we may need to restart the server first) everything works much as it did before. We still have the same pagination, sorting and searching behaviour but now the data is being supplied by the Rails application instead of being loaded all in one go on the client. That’s it for our episode on DataTables. It does require some effort if you need server-side processing but the end result is well worth it. If you’re interested in an alternative solution where we create something similar from scratch take a look at episode 240.